I have to tell you, I was elated when my dear friend Annie of LardMouth.com introduced me to Raw Milk just shy of a decade ago! I was elated because I had been extremely dairy-intolerant for my entire life up until that moment. Once upon a time, just one taste of dairy and I would be immediately congested. I had denied myself the joy of milk, cream, ice cream, butter, and cheese for sooo long. It was so exciting that I could consume raw dairy without getting sick and what a huge convenience it was too! I was all in, people. Passion was set aflame. I sought out the founder of the largest Raw Milk Dairy (in the freakin’ world) and learned from him. I took a private tour of the inner-workings of the dairy. I even volunteered for the dairy. Have I mentioned I like to know where my food comes from? Milk became my on-the-go snack. I would just throw a bottle in my handbag and fuel up as needed. It was cool, filling, refreshing and contained great probiotics & nutrients! At this time I was ravenously studying the nutritional habits of native cultures. People untouched by modern convenience and the food of modern commerce seemed to also be virtually untouched by the chronic illness, tooth decay, allergies and the food intolerances rampant in our modern processed food society. This is when I began to study the massive health and taste benefits of fermentation, which would change the course of my life forever. 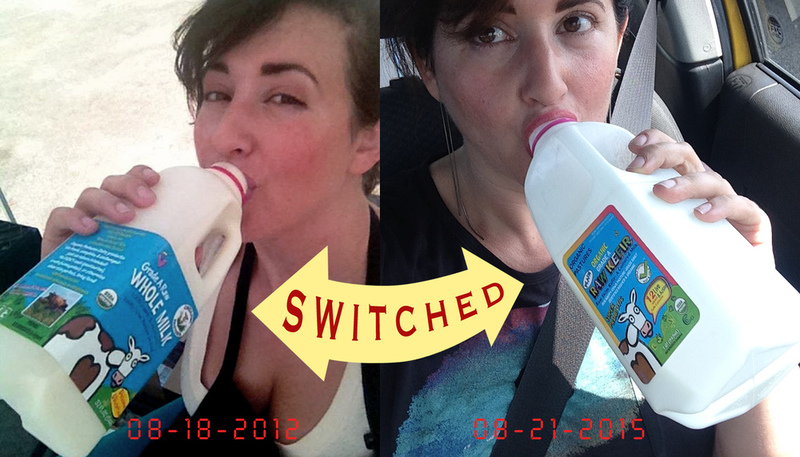 Photos: Here I am back in 2012 chugging milk and here I am in 2015 downing a quart of kefir. OK! I might take too many selfies with various food When I spied this old photo recently, it inspired me to consider #1 why I hadn’t changed my hair style and #2 why I had changed my on-the-go snack of choice. I found that almost no native culture consumed fresh dairy and certainly not in the quantities we do. Of course there was rarely refrigeration of a modern or primitive sort so milk was sour or fermented from lack of cold storage. Because of this, current science dictates that people would have likely enjoyed a more diverse gut bacteria. Also, fermented milk is higher in probiotics and lower in the milk sugar lactose. I know you might be saying; “Hey, I already drink raw milk which has 100 + probiotics. Why the heck do I need more? !” Because friend, the name of the game is diversity in every healthy system in nature and we are a part of nature! When it comes to probiotics more (diversity) is better. Did you know that current science shows that people with more diverse gut bacteria are less likely to be obese , to develop autism spectrum disorders, dementia, Alzheimer’s, eczema, allergies, diabetes ,and a rainbow of digestive disorders? I could go on but do I really need to? If you want to understand more about gut bacteria, I highly recommend you read this blow-your-mind book Brain Maker !!! Don’t have time to read? Me either! I use this awesome audio-book service and am now very well read to. Heh! Get More From Your Milk. Make Kefir! Yes, I’ve made drinkable yogurt too and that is delicious and just as convenient as milk or kefir but kefir contains approximately 30 different probiotic strains in addition to the raw milk strains vs. yogurt, which contains 5, or less. Plus, the beneficial microbes contained in kefir have been shown to inhibit the growth of harmful bacteria like Salmonella, Helicobacter Pylori and E. coli . Kefir made from full fat dairy is also an excellent source of calcium and vitamin K2. Vitamin K2 plays an important role in calcium absorption. Such a critical role, in fact that one study found supplementing with vitamin K2 reduced the risk of bone fractures by a whopping 81%. Again, I could go on but, you’re super smart so, I really don’t need to. Each Bite of Food Should Be Packed With Nurishing Benefits! Now, I don’t begrudge anyone his or her lovely milk and cream. In fact, I adore a little cream in my tea! Yum! However, after the initial excitement of consuming dairy with abandon, I began to naturally consume a little less and decided to make the small change of consuming primarily fermented dairy products when I have dairy. I love enjoying the most from all experiences in life and feel strongly that each bite of food should be packed with the most benefits possible. I want this for my family, friends, myself. I want this for all of us. Because the more healthy people there are out there, the better life is for all of us! So, start making your own kefir and dare to be a super human! Here’s my easy kefir recipe. What little changes have you made that have yielded you big results? We all want to learn from you!